Always a fan favorite, it’s no surprise this sentimental tiara with a memorable design made your list of favorites. Made by Cartier, this diamond ornament was a gift to Princess Margaret of Connaught when she married Crown Prince Gustav Adolf of Sweden in 1905 from the Khedive of Egypt. A fitting gift, as the couple had first met in the Khedive's country. It was also used as a flexible stomacher or ornament of sorts, as shown in the original sketch of the Princess’ wedding gifts and as worn by her in the portrait shown. 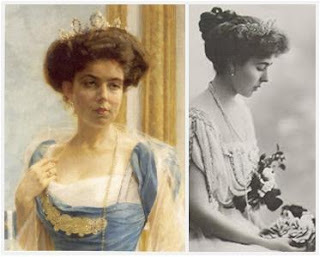 ﻿When Margaret died in 1920, her daughter Princess Ingrid inherited the piece. She brought it with her when she married Crown Prince Frederik of Denmark and eventually became Queen of Denmark. It remained her personal property until she passed away in 2000. ﻿﻿The Danish royal family under Queen Margrethe does not do much sharing when it comes to their jewelry, but things were a little better when Ingrid ruled the roost (of course, Ingrid had more jewels than Margrethe does, as Ingrid did not leave all of her stash to her oldest daughter alone). She loaned this one to her niece, Sweden's Princess Margaretha, while she was in Denmark for Margrethe's 18th birthday celebrations. And then she began a family tradition that continues to this day when she loaned the Khedive to each of her three daughters on their wedding days. 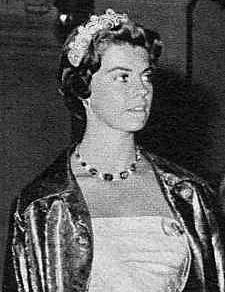 Every female descendant of Ingrid's has worn the tiara for their wedding ever since Queen Anne-Marie in 1964. Anne-Marie's youngest daughter, Princess Theodora, is the only granddaughter currently unmarried; after that, it will likely be a while before we see if the tradition will continue to the great-granddaughters as well. When Ingrid died, she left the tiara to Anne-Marie, her youngest daughter. (Anne-Marie is the one that had a taller base put on the tiara, which is why it looks quite different on Princess Nathalie in the photos above.) 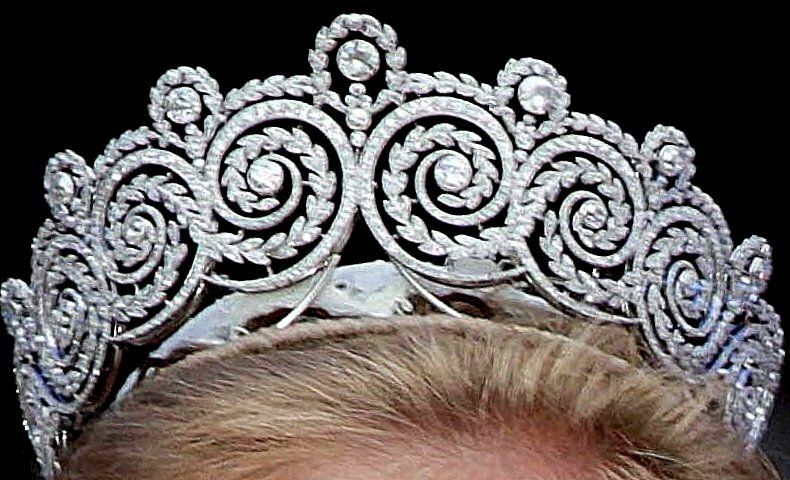 It's interesting to ponder what will happen to the tiara now that it is in the Greek royal family. The Greeks are royals without a country, but since they have such close family ties to other current royal families, we still see them attending big events regularly. However, it is inevitable that as time and generations pass on they will have fewer royal events to attend, and a lack of tiara events combined with the occasional need for funds is often the culprit behind the sale of family jewels. 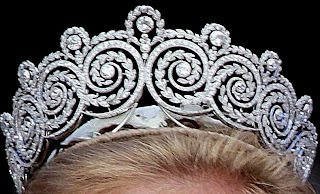 This is one of the most interesting tiara designs in use: the swirled design seems modern from far away, but the detail up close turns that modern clock back in time. It’s never been a huge favorite of mine, but if I had to guess why so many of you cast your vote in its favor, I’d say it’s maybe one part design to two parts sentimentality. Am I close?